This is a 2017 Ford F-150 Raptor Clear Body for PRO-MT. Introducing one of the most anticipated Truck bodies of all time: the all-new 2017 Ford F-150 Raptor truck body for Pro-Line PRO-MT Trucks! 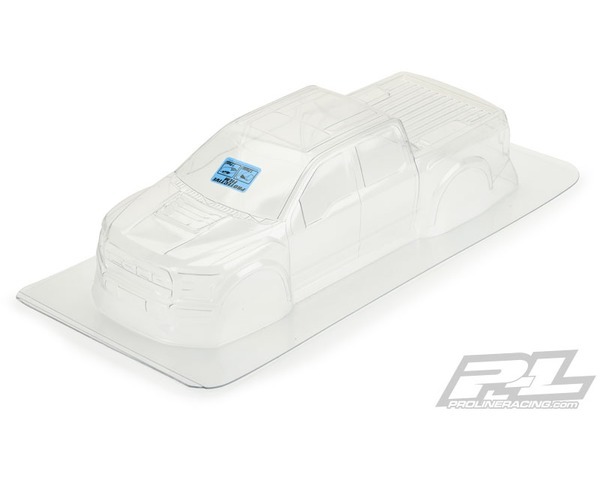 Pro-Line has included all of the scale detail into the body and sticker sheet for a highly detailed yet functional replica of the 2017 Raptor. The 2017 Raptor has a bold and tough body style that is the most cutting edge look available. This body completely transforms your Pro-Line PRO-MT Truck into a True Scale Lifted Truck. If you are a Raptor fan, then this is the body for you! Dont show up to the local bash spot or track with the same body as everyone else. .. Get your 2017 Ford F-150 Raptor body from Pro-Line today!